Johnny Cerpas is your Captain on the Macushla. He is licensed, English speaking, and has over 15 years of experience fishing the local waters. Returning clients always request him when they come back to fish with us. Johnny is very competitive, is passionate about fishing and raises a lot of fish. Our crew takes a lot of pride in what they do, how they keep the boats and the equipment, and most of all how they take care of our clients. 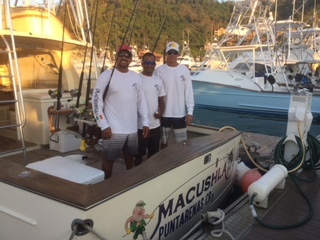 Their love of the boats and sportfishing is very apparent and they are always in the running for the best results of the day. We are dedicated to making your fishing trip successful, safe and memorable.